I made this plastic bag laundry bag a while ago, but just now got around to taking a picture of it. And after months and months of nonstop use, I can honestly say that this thing is durable! I primarily use it to lug my laundry around or to carry my clothes if I’m going away for a few days. But I’ve also used it to store food and cooking utensils when going on camping trips, then flattened it out and used it as a mat to sit on if the ground is wet. It has many uses. 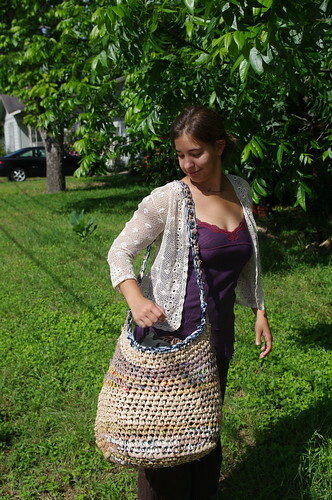 Basically, I love this bag and often find myself wishing I had a few more (which I’ll eventually get around to making). And I like that with the tan and brown earth tones, the bag appears to be made of hemp or twine rather than plastic. Indian food is probably my favorite food. There are SO many creative dishes. 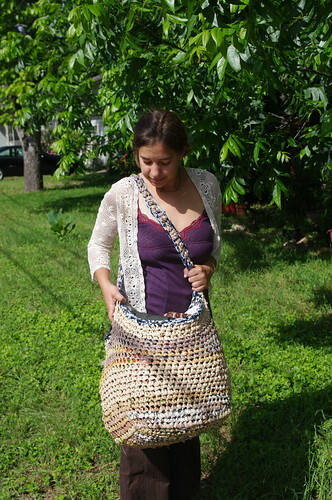 I am going to try and learn from your link how to make a bag like this of my own. I have also had conservation on my mind, lately. I will also post this to my facebook. 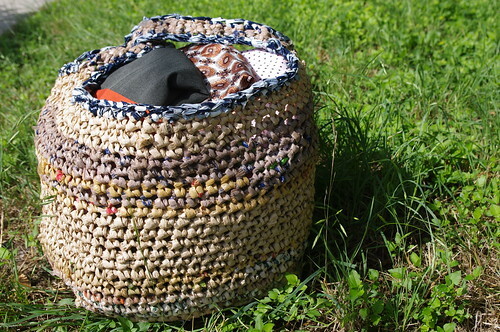 ← Plastic Bag Crochet in India?